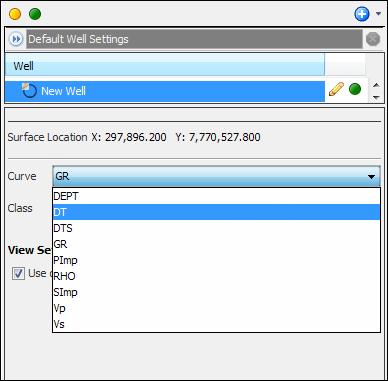 Once you have defined the general information for a well (see Creating a New Well), you can add log curve data (LAS or ASCII files) for the well. For more details on the format of a LAS file, see Well Import File Formats. Note: Insight supports LAS Version 2 in wrapped and unwrapped formats. LAS Version 3 is not supported. Open the Curves tab in the Configure Well window. This window is displayed once you have saved the general well information. In addition, you can also open this window by going to the Well tab in the Control Panel, right-click at the well item and click Configure Well 'WellName'. Open the Curves tab. Click New Log Curve Set to add a log curve set for the well. The Add New Log Curve Set window will be displayed. At Data Source, select Import File to import a LAS/ASCII file. At Name, type a name for the log curve set. If you do not type a name, Insight will enter the name of the log curve file you import. Type any additional information about the log curve set in Notes. At LAS/Ascii File, click the Select File folder icon. Select the log curve file for the well and click Open. By default, information of the selected file will be displayed in Notes. Insight will automatically populate the Depth Curve and Type/Datum fields with appropriate values. You can make changes from the drop-down lists to correct any of the automatically assigned default values. Click the Preview the file eye icon to view the file content. As you enter the information of the well path, you will be notified if there is any error or warning. Click the exclamation icon to see the details of the errors/warnings. Icon will turn green if there are no errors/warnings. Note: Currently, you are not allowed to import log curve if there are non-increasing depth values. Tip: You can view the original file by clicking on the icon at Imported (see image above). Check that all the curves are listed correctly in the Curve drop-down list in the well Details Panel. Display the well on the IL/CL View by navigating to the location of the well. The colourbar of the well depends on the Curve and Class chosen in the well Details Panel. 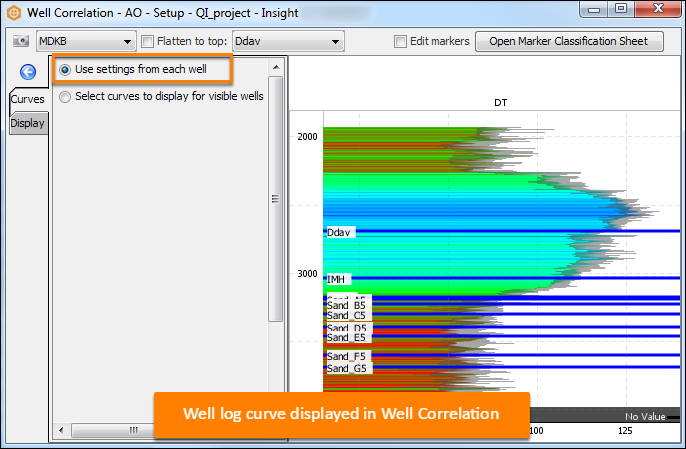 Display the well curve in the Well Correlation window. The curve displayed is based on the Curve chosen in the well Details Panel (see Displaying Well Correlation). Note: If your log curves are not displaying in the Curve drop-down list after importing, it is likely that Show Log Curves of Class is enabled in the Default Well Settings. This option will restrict Insight to only show logs of that particular class for all wells. Deselect this option in the Default Well Settings to display the imported log curves (see Defining Default Well Settings).